1. The major distinguishing element between the final account of a partnership and a sole trader is the __. 2. Goodwill appears in the books of a business only if it has been __. 3. Payment of cash of ₦20 to john was entered on the receipts side of the cash book in error and credited to john’s account. which of the following journal entries can be used to correct the error __. What is the purchase figure for the month? 5. Subscription relating to the accounting to the accounting year 1993 in the income and expenditure account is __. 6. Accumulated fund on 1st January 1993 is __. 7. Sobande incorporation acquired a machine that involved the following expenditures and related factors. What is the initial accounting cost of the machine? 8. A pottery company had sales of ₦176,000 during the current period and a gross profit rate of 40% the company cost of merchandise for sale during the period was ₦128 000. The company’s ending inventory is __. 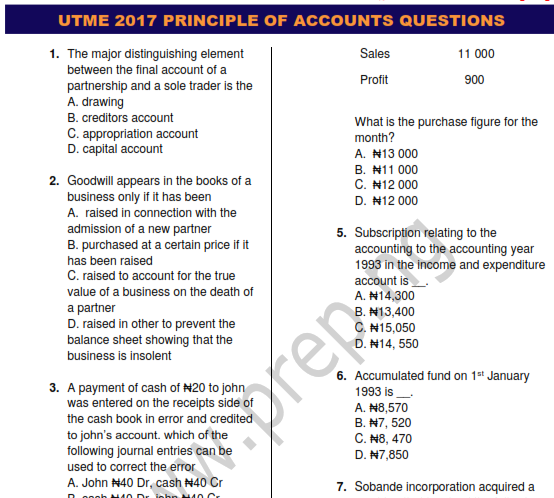 Use the information below to answer question 9 and 10. 9. The quick ratio is __. 10. Determine the owners’ equity. Lighting, power, insurance and rent relating to the factory are apportioned 1/3 , 2/5 , 1/6 , and 1/7 with totals ₦30,000; ₦75,000; ₦36,000 and ₦56,000 respectively. 11. What is the cost of the opening raw materials? 12. The production cost of finished goods is __. 13.The ₦6,000 subscription received is __. 14. What is the subscription to be charged to income and expenditure account? Use the information below to answer question 15 and 16. The gross profit ratio for the company is 25%. 15. 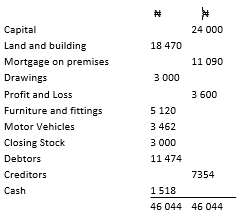 If the total expenses is ₦20 845, what will be the net profit for the company during the month? 16. The closing stock for this company is __. Use the information below to answer question 17 and 18. 17. What is the capital employed? 18. Calculate the value of fixed assets. Use the information below to answer question 19 and 20. It is the tradition of the organization to apportion expenses in the proportion 60%: 40% for S and T respectively. 19. What is the net profit made by department S? 20. The depreciation to be charged to department T is __. 22. Goods withdrawn from for private use are credited to __. 23. Stationery which will be used for a long period of time is usually recorded as an expense instead of an asset. This concept is called __. 24. Adaobi mistakenly entered ₦7 000 as credit in Abba’s account instead of Baba’s account this is __. 25. The gross profit disclosed in the branch stock adjustment account represents __. 26. Partner’s share of profit is credited to __. 27. What is the cost of raw materials consumed? 28. Calculate the prime cost. 29. Using FIFO method, what is the value of the closing stock? 30. What is the value of closing stock using simple average? 31. The gross loss on manufacturing is always transferred to the __. 32. The depreciation on a motor vehicle that is being used for manufacturing and administration is charged to the __. 33. In bank reconciliation process, discrepancies caused by timing arises as a result of __. 34. The process of reconciling cheque between banks termed cheque __. 35. Debtors opening and closing balances amount to ₦6 500 and ₦7 600 respectively. What is the sales value? Use the information below to answer question 37 and 38. 37. 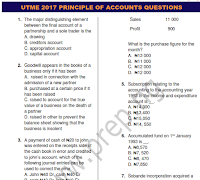 Calculate the gross profit. 38. 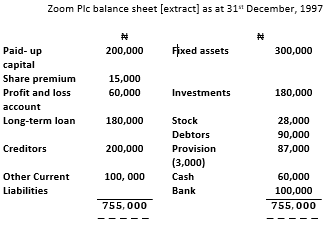 Calculate the expenses debited to the profit and loss account. Use the information below to answer question 39 and 40. 39. What is the total income for the period? 40. What is the balance carried down?